With the Boys Soccer Season nearing the half way point, the Davis High Soccer Team went into spring break with their first loss to Weber High. However that did not stop the team from winning their first game back, putting a win and another shutout onto their record. Clearfield, the team that usually finishes last every year in 6A, had stepped up and emerged victorious against Syracuse and Northridge. Even though both teams lost their first games against the Darts this season, the team knew Clearfield would at least compete and former assistant coach Kennaley would go down swinging. Beginning the game, the Darts came out and dominated possession across the field. With the midfield and forward putting unrelenting pressure on the Falcon’s defense, they were lucky to get the ball past half field. If they were the Dart’s defense was there to clean it up. After countless pressure the Flacons, eventually were going to make a mistake and pay for it. The first goal was scored about halfway through the first half after the ball went out for a throw in down by Clearfields 18 yard line. As Captain Kaden Chino threw the ball in, Midfielder Zach Kennedy flicked the ball across the box to the Darts leading scorer, Josh Harwood. Ending the first half strong and putting the Dart’s one goal closer to winning the game. While the second half started, so did the rain. If you have ever played soccer on grass while its raining you know that the ball skips and slides faster then it normally would, and turf is is even more of a slick canvas for the soccer ball. While the Dart’s battled to put the game away with another goal, time began to tick and the Falcon’s began to scramble. With 10 min left Clearfield lost the ball and gave Davis the perfect opportunity for a counter attack. As the through ball was played, Cole Anderl ran onto the ball and slid the ball right under the keeper as he dove. At that moment the Falcons knew there was no coming back and the game was over. While the Darts celebrated their win, each player couldn’t keep their next game against Layton out of their heads. Davis High boys baseball takes on the Clearfield Falcons at Clearfield this week. The Dart’s team is currently doing well with a 10-5 record overall and a 7-1 region record. The Darts have a good chance at winning a championship this year with them being ranked 16th in the whole state. The high school baseball season started in the middle of March and is supposed to end in early May. With this game being the 16th of 25 games in the season, this means that the season is more than half-way over, and the end of the season is almost here. Davis will have more momentum going forward for the rest of the season, especially for the seniors on the team who will be leaving soon. I would encourage all Davis High Students to go support the baseball team at the remaining games they have, you will not regret it! For seven years straight, the Davis High girls golf team has gone undefeated against schools across the state. The team works hard to compete against schools across the state and secure a position in the top 5 for state championships. In previous seasons, the team has placed second and third overall at state, but they hope that this state champs will bring them first place. The golf team has gone undefeated for the seventh season, playing against schools varying from all different parts of the state and school district. The team has been working to become closer and accomplish team goals. With state championships close by, the members of the team are confident in their ability to succeed and take a spot as one of the best teams in Utah. In the past two years, Davis has taken third and second, but Caylyn Ponich, a member on the golf team, thinks that this year they will take first. “I think we’ll pull through, our team is pretty stacked,” she commented. Over the course of the golf season the team has faced several different obstacles, and flourished to become one of the most diligent and successful teams at Davis High. Davis High school hosted the track Super Meet on Tuesday, March 19, and Wednesday, March 20. The Super Meet is the first state qualifying track meet of the year. The track team trained really hard for this meet and is learning and working harder for future ones. There were 15 schools that showed up to the meet. Davis High School got 3rd in boys and girls. The team did great, and many students placed and qualified. 4×100 boys got first, Ellie Lundgreen got 1st in the 3200, Kelsi Christensen got first in 100 meter hurdles, Kelsey Levitt got 1st in javelin, Hope Preston got 1st in 1600 meters, Sydney Hedquist got 2nd in 1600 meters, 4×8 boys got 1st place, Mitchell Clove got first in 400 meter, 4×100 girls got 2nd overall, Brendon Redford took 2nd in the 200, and the boys sprint medley relay took 2nd. Those are just a few of the students at Davis who placed, but there are many more from our extremely impressive team. The school that took 1st in boys was Syracuse, and 2nd place was Herriman. The schools that got 1st in girls was Herriman, and 2nd was Syracuse. Herriman and Syracuse are now the schools the track team will be looking out for, the new rival schools. To train against these, the track team said they will be working hard on relays and just training in general. At future meets the team will be sure to keep an eye on Syracuse and Herriman. Thomas Hogan was on the track team earlier this year, but sadly passed away. At the Super Meet some of the Davis High track students wore green ribbons in honor of Thomas. The track team was told to find a reason to run, and if they couldn’t find a personal reason then they should run for Thomas. Thomas was supposed to be here to finish his track season, so students are now finishing it for him. The Davis Boys Lacrosse team is one of the biggest clubs at Davis High. This is the last year that it will be a club as Lacrosse has been approved to become a sanctioned sport by the UHSAA. The Darts will look to take advantage of their experienced team and have a lot of success in the current season. The team has what they call their “12 Absolutes, 6 Always, and 6 Nevers.” Some examples of “Always mentalities,” are to always have a winning attitude, and always have your teammates back. As Attackman, Cade Abendroth, explains, “Our goal is to follow our absolutes and we believe that if we follow them correctly, we can win state.” There are some talented teams standing in the way of the Darts’ goal such as, Corner Canyon, Brighton, Olympus, and Park City, but they remain optimistic as they have a big group of experienced seniors and leaders. Lacrosse is an upcoming sport, especially in the state of Utah. The games are intense, fast pace, and are full of excitement. Davis High Lacrosse games are sure to be one of the most exciting events going on in Kaysville this spring. Be sure to support the Brown and Gold as they hit the field this spring! The Lakers came into the 2018-2019 basketball season after receiving the best player in the world, LeBron James. LeBron was the addition to a very young and high potential team. People had been hoping that, with LeBron’s experience and the young teams potential, they would find themselves in a playoff spot. As the season has gone on this is not the case. Injuries have cut the Lakers playoff hopes with LeBron suffering a groin injury on Christmas day that kept him out until the start of February. During the time period that Lebron was out, the Lakers also lost another key player in Lonzo Ball. January 19, the Lakers traveled to Houston to face James Harden and the Rockets. During the middle of the game starting point guard, Lonzo Ball, landed funny and sprained his ankle. It was a grade 3 ankle sprain and new reports have said he is done for the season. The Lakers came into the game against the Rockets with a 25-21 record, 4 games above .500. Since Lonzo Ball has been injured the Lakers have gone 6-16 without him. The Lakers sit at 31-36, 7 games behind the 8th seed in the West. In addition to those injuries, key player Brandon Ingram is reportedly out for the season. The Lakers are now cutting back on LeBrons playing time and are looking forward to next season. The soccer season has just begun and the feud between rivals has already begun to build. With Davis’s second game against a long time rival Viewmont, all players were on edge for the game. This was the only game against Viewmont, due to their region change, and Davis’s only chance at triumph. With spirits high the team loaded onto the bus preparing for the game ahead. “We consider Viewmont rivals, even though they are not in our region anymore. You always want to beat your rivals. For our second game we played well and we played more the style we are trying to play. There was a lot of energy and players fighting to win. It was a tight game with chances from both sides but ultimately it ended in a draw.” summed up by Captain Kaden Chino. As said by Kaden Chino, after the hard fought game it did end 0-0. Usually most games would go into golden goal, making the first team to score the winner. If still no one scores, the game goes into a PK shootout. In which the entire starting line up, including the keeper, shoot against each other from the penalty spot. While the game was played against a long time rival, condition of the players came first and there was no overtime. With many players on both sides sitting on yellow cards and a few injured the coaches decided to call the game. Blake Hafen a center back and vital role to the 4-4-2, injured within the first half, coach Souli Phongsavath switched the team to a 3-5-2 for a better winning strategy. “You guys competed well! I think that as the guys develop the chemistry the goals and the wins will follow. The skill and the work ethic was there, now it’s just coming closer as a team to get the nitty gritty done for those wins” said assistant coach Courage Cottrelle. The team itself is fairly new this year but still has the seniority the team needs. With lots of potential the whole team plans to work harder than ever for the upcoming final preseason game against Murray. Captains Kaden Chino and Tyson Bailey plan to lead the team to many victories this season with the help of the coaching staff to fine tune for the perfect strategy. As we head into the month of March, the biggest tournament in all of sports ensues. 64 of the country’s best college basketball teams compete to ultimately hold the title of national champions! There are 6 rounds and each round half of all teams get eliminated. Quite literally it is do or die. This is part of why they call it March Madness, because any given team on any given night could pull of the upset against a higher seeded team. The tournament began in 1939 and since then it has only gotten bigger and bigger. Perhaps the most popular part of this event is filling out a bracket and predicting who will win it all. The odds of filling out a perfect bracket are 1 in 9.2 quintillion. Little to no people have ever filled out a perfect bracket. Only one 16th seed has taken down a number one seed which is part of the madness. Part of why people are so obsessed with this tournament is that, for the most part, it is near impossible to guess every team. Another reason why people love this tournament is Cinderella teams. These are lower seeded teams that make a run in the tournament and prove they can ball. Heading into this year there are some good teams to watch for. Some of these teams being Duke, North Carolina, Tennessee, and many more teams. Let the madness begin! All the way from Vegas, the DHS Girls Lacrosse team (with 22 girls on Varsity and around 18 girls on JV) is with the best to come. There, they had a tournament, which was not part of the season, but they still had a great time. ”We did tournaments Friday and Saturday. It was the 1st time we could all play together, and it totally united our team and we had a lot of fun”, said Savannah Bentley , the senior that is on the team since her 9th grade. “The trip was really fun. At the end of February we played against multiple teams and it was a good practice”, said Kelly Maynes, a sophomore that joined the team last year. “I have really high expectations for this season, we have been trying some new things with our defense and our attack, and when we can get it to work we do super well’, said Savannah. “Even though we got 2nd last year, it was very good and I am hoping we are gonna make it again and our team is pretty good”, said Kelly. Move around you scheduled and save the date for Monday March 12th at 6pm. You will not want to miss out on this great opportunity. Not only will you be able to sit with your loved ones and eat dinner but you will given the chance to win some amazing items in the live auction and also the silent auction. By coming to this event you will be supporting Davis Highs Baseball program and student athletes who have worked hard all year preparing for this upcoming season. “We have some amazing items that have been donated as well as some sweet memorabilia such as Donavan Mitchel Jersey and shoes.” states Head Coach Josh Godfrey. The shoes alone retail for about $200. And the jersey sells for at least $150. And there are many more items like tickets to the Utah Jazz against the Brooklyn Nets game on March 16th, and it’s in the Utah Jazz Lexus Suite/Dinner. Other items include: Toshiba 32″ HD Smart TV, and a Traeger Grill Pro Series 34. “We are stoked for our dinner next week, it will be a great time! We are all very excited to be auctioning off so many cool items. We are looking forward to a great season and hope to see you all there!” says team player Tyler Jorgensen. The event will be hosted by Dave Fox from Channel 2 News. As well as a guest appearance from the Utah Jazz mascot The Bear as well as the Salt Lake Bees mascot Bumble. Support your Davis High Baseball team and come for an enjoyable night with a yummy dinner and to kick off this new season! Spring 2019 is here, as well as the Davis High School Boys Soccer season. With last years seasons ending to the loss to Herriman during the 2nd round of the play offs, returning players and newcomers have been preparing in months prior for the season ahead. During the Month of February, freshman and seniors come together to condition before the tryouts. This year ran by assistant Courage Cottrelle, a former soccer player who graduated and took region for the team in 2015. Also with the help of seniors Kaden Chino and Tyson Bailey. Along with the new players for this season came Matt Tidwell, a new assistant coach. Coach Tidwell, also known as “Uncle Rico” for the mentality he brings, and the plenty of experience on and off the field. He played college ball at Weber and even went as far as training with RSL. He will be a great new addition to the team and play a big part in this years season. Although this years team is fairly new, there are plenty of returning players, as well as our long time dedicated coach Souli Phongsavath. Souli has been a coach here for many years, and has brought region, state, and even national trophies here to Davis High. He has had a huge impact of the soccer program and shaped it to what it is today. Davis High Soccer has always taken pride in its team and how hard they work. This year, working especially hard is our teams defensive back line. Returning to the line are seniors Tyson Bailey, Kaden Chino, and Cannon Gadd. Other returning players, who will play a role in the back line are juniors Oliver Iverson and Blake Hafen. Supporting the defensive line is Noah Larkin, returning as a junior to play goal keeper. As the back line continues to train and work hard, the midfield and forward players use that as inspiration to train harder. Returning to the midfield are, Zach Kennedy, Wyatt Saunders, Curtais Watkins, and Colby Cook. Along with Pedro Silva, who is staying in the U.S. as a foreign exchange student and will play for the team before he leaves for his home in Brazil this summer. Another returning player, Josh Harwood, plans to lead the team to victory as our goal scoring forward. With many experienced players this year, the team has one goal in mind. One goal over all the others, to win region and state. With last years seniors leaving behind their legacy and yearn to win, the team is more determined then ever to make this years season one to remember. With spring just around the corner students are getting excited about the warm weather, blooming flowers, and track season. That’s right, outdoor track is starting up again, and this is something you’re gonna want to get excited about. Coaches and athletes alike are all looking forward to getting back into it. Their main goal this season is to win a championship. Last year, boys took first place at the region and state championships. This year they’re hoping to keep that streak going and get the girls up there too. Here at Davis the coaches like to emphasis the team component of track. In fact, coach Hyde always capitalizes the word TEAM in every email and message. “We want to emphasis that it’s a team sport. It’s not really a team sport at other schools, but it is here,” coach Agnello commented. Whether it be cheering each other on at meets, pushing each other at practice, or all coming together to honor and remember Thomas Hogan, this is a TEAM. This is a TEAM that you’re going to want to be a part of. With 10 seconds remaining in overtime the Darts had the ball with tensions and tempers flaring. Finding the composure to score as a teenager seems a daunting task. As Jake Sampson drove the lane for a contested floater to give the Darts the lead. “It felt really good when it left my hand, It is something that will stay in my memories forever.” Stated Sampson. The shot was a silver lining finish considering a missed foul call where Jake Sampson was leveled to the floor in obvious pain just minutes before. As the Davis supporters erupted in outrage this clearly provided an added motivation to convert at the end of the game. Westlake had one final chance with a corner three as time expired that ironically nested the ball between the backboard and rim to end their season. Though Sampson got the last minute glory the Darts were primarily led by Senior Forward Tyson Garff with an outstanding 27 points. Davis leading strong through the first quarter and into the beginning of the second quarter with a score of 14-4. But as the second quarter is played we slowly see Westlake wake up. By the third quarter both teams were on fire, Westlake caught up to almost a tie, 42-41 but Davis was determined to stay in the lead. This third quarter score brought us to a competitive fourth quarter which eventually led to overtime where the Darts capitalized. Additionally, Brendan Redford added 16 points and Trevan Lienhardt with 6 points and 6 assists. The Darts face off Wednesday February 27th at 4:10 P.M. against the Kearns Cougars who have a record of 19 wins and 4 losses on the year. With the impressive record of 10-2 in the regular season, the boys’ basketball team is heading into the playoffs with the second seed from Region 1. The Darts will be facing the Westlake Thunder in their first playoff game on Monday February 24 at Weber State University. The Thunder have a record of 4-4 in Region 4. Their region could be considered the toughest region in the state, with teams like Lone Peak, American Fork, Pleasant Grove, and Bingham. The Darts should match up against the Thunder very well, because both teams have a lot of talent and the same end goal: making it to the state championship. This game won’t be easy for the Darts, but with their team chemistry and grit, they should be able to go very far into the playoffs. “In order to beat them, we need to match their physicality, out-rebound them, and do the things that don’t take talent, like working harder” said Jack Rigby. In order to make their goals of a state championship a reality, the team will need to take it one game at a time, and their main focus right now is beating Westlake in the first round. The Darts tip off Monday at the Dee Events Center at 4:10 P.M. The Davis Darts battled at the Utah state wrestling finals. With 3 placers and many matches won, our team did better than many years in the past. Parker Coffey and Heston Percival both took second, and Eli Knowlton took 6th, but many placed top 10 in the state, which is impressive enough. When I asked Heston about how he felt about how the overall team performance he said, “I was impressed by the wrestlers heart, and that they left their everything on the mat”. Heston’s performance impressed not only our team, but others too. I was told by a former opponent of his that, “He really turned it on here, and made many of his matches look easy”. Parker Coffey, easily the best wrestler on our team, also did very well, performing better than even he thought. “My matches went better than I had hoped. I thought I was gonna have some really close matches going into the finals, but won all my matches by at least 6 points. I hoped to have a closer match in the finals, but I wrestled as hard as I could,” Parker said. Yet what he doesn’t explain is his finalist match was against the 7th best wrestler of any weight class and school division in Utah. Parker was the only one he didn’t pin there at state. Eli Knowlton, wrestled on a torn MCL, and though he didn’t do as well as he wanted, he did as best he could on the mat. Having 3 tough battles and losing to the same kid led to him taking 6th. Going to state in a knee brace is impressive enough. Placing on top of that is a total win. Not placing in state and the fact that it’s over has made many wrestlers shed tears. The brotherhood especially is what us seniors felt. The fact that it’s over is saddening. Us brothers that have spent over 2 hours in matches alone, a year accumulative in high school, and many months in junior high together participating in a sport that we love. We will soon have to part ways in our lives. Yet those hours together and the memories we made together were worth every second of pain and every loss on the mat or in practice. Though winning matches was great, the brotherhood was the greatest win of them all. The Simplot games were held in Pocatello, Idaho and once again the Davis Indoor Track Club accepted the challenge. Athletes from all over the world attend the meet to run and compete in indoor track and field events. However, this year was different for Davis High School Indoor Track Club. Having to overcome an emotional trial this weekend. The athletes of Davis High came together and finished their races. “When I first got up there I felt a lot of emotion when I looked at our students, they had been through a lot. Our athletes were able to dig down and stay focused throughout the trial they were facing. It was awesome to see our athletes come together and finish their races.” Stated Brad Chapple, one of Davis High’s Vice Principals. Naturally, with any adversity in sports it causes teams to change and grow. “At first, we were thinking..well what do we do? Do we just pack up and go home? It was very emotional. A lot of the other teams up there were there for support. Most people chose to stay and race. It was good to have us stay together as a team, and we were able to lean on each other and support one another. ” Explained Coach Paul Timothy. “We learned that we can do tough things. We grew closer, but at the same time it was an eye opener for all of us.” Said Alicia Halverson, an athlete on the Indoor Track Club. One of the most emotional moments of the meet was when Head Coach Markham Hyde finished the “The Coaches Mile”. On Friday night at a meeting Coach Hyde told his team that he too would finish the race (He had previously signed up for the coaches mile run). On Saturday at 11:00am Markham and about 12 other coaches started the mile. Davis student-athletes lined the track to cheer for their coach. “Markham finished the last lap as the lone runner, but I would argue that he wasn’t alone. As Coach Hyde rounded the last turn, he was met with cheers from his students and coaches. Then I looked around the arena, it seemed like everyone was rooting for coach.” According to Vice Principal Brad Chapple. Despite this tragedy, the track team still placed. Trey Ferrin took 9th in the Boys 3200, Ellie Lundgreen placed 3rd in the Girls 3200, and Kale Thomas placed 4th in the Boys high jump. Davis also placed 1st in the Boys 4×800 relay, 2nd in the Girls 4×800 relay, and 3rd in the Girls medley relay. At the end of the day, the Indoor Track Club turned to one another not only for support, but for a bonding experience that only comes through extreme adversity. The ultimate goal of any high school sport is placing or taking state, and 13 wrestlers are guaranteed and 4 alternates have a chance of being there too. Utah 5A/6A state tournament will be held on the 13th and 14th of this month at Utah Valley University, or UVU for short. The divisional tournaments were held on the first and second of February to see who would be qualified to go. Two divisional tournaments are held for each high school classification (i.e. 1A, 2A, 3A…), and the top 8 in both tournaments meet in state. Each bracket in state is a 16 man bracket, and there are 14 different weight classes to compete in. All seniors are going to state, two taking first place, two winning third, myself (Max Barnett) at sixth, and one placing eighth. 13 over all placed 1st-8th and 4 placed 9th. those who placed 9th go to see if someone in their weight class is unable to wrestle, letting them in. State is the tournament of the year, and the second hardest tournament, the Rockwell rumble being the first, in Utah. For many there this is their last chance to prove their skill in this sport, because after this stepping back on the mat wont mean the same thing. Each match a battle and every one that is won is a step closer to the medal deserved. This tournament being a stage for the wrestlers from Davis high to fight like never before. On Friday, February 1, the Davis High girls’ basketball team will go up against Fremont. The game will take place at Fremont High School at 5:15. If they win this game, it’s a step forward to competing in region. The pressure is high for this game. If they win, they’re tied for first place, and it’s a step towards region. To prepare they’re training like they always do: watching film and looking for ways to improve. They’re improving their skills and fixing their flaws. The coaches even said they’ve seen a focus in the team. So what do you say Davis High Mob? Will you show Fremont what the best student section on the planet looks like? 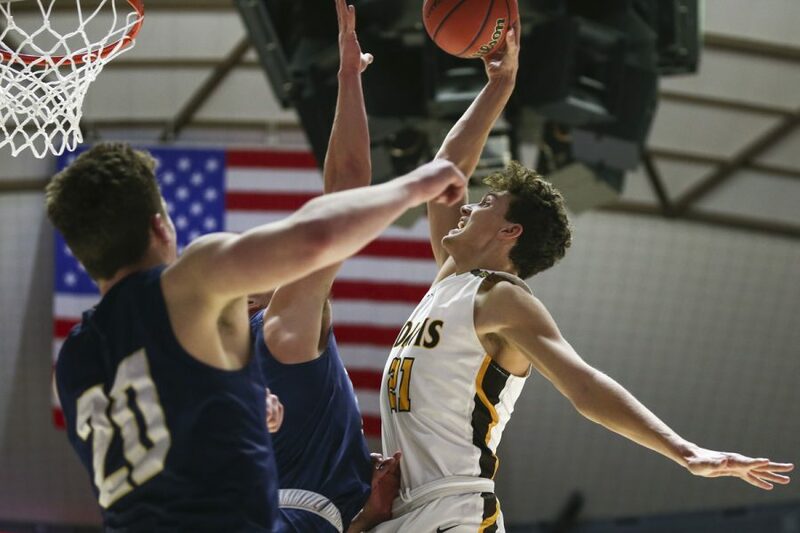 Davis High boys basketball entered the second half of regions Tuesday against Weber with a huge target on their back. The Darts were 6-1 and looked to continue that pace on Tuesday. “It felt really gratifying to know that all of our hard work from the off season had payed off,” said starting center, KO Fisher. The Darts continued their defensive trend by holding the warriors to 38 points in 4 quarters of play. The Darts obliterated them by an outstanding 16 points. Their victory was led by Brendon Redford and Tyson Garff who both contributed 13 points and eight rebounds. The Darts hung their hat on the defense of end by leading the region in lowest points scored against them by a fair margin. “Our communication has been really good and helped us be on the same page. It has been key to our defensive energy all season.” says starting forward, Brendon Redford. This consistent defense has been a trademark of the Darts region play and has clearly helped set them apart. The Darts look to compete for a region championship with a 7-1 record this Friday night at Fremont. The Davis High girls’ basketball team has started off their season strong. With their previous game at Northridge on Friday, January 25th, and region champs in February, the team is readily preparing for the next several games up until state tournaments in February. Could this season become a legacy for the Davis High girls’ basketball team, or will it just become a part of their history? “I think people expected us to be a young team and kind of inexperienced, but I think we’ve proven a lot of people wrong”. Said Loveland. While winning games and succeeding are some of the most important aspects of a team, working together and cooperating on and off the court are still a very crucial part of being an effective basketball team. Team lunches, sleepovers, and dinners together are all a part of how this basketball team bonds to create a strong competitive advantage. With the season passing the halfway point, the team is confident that state will be no tough challenge. In their division there is 6 teams, and they must make the top 4 to move onto state. Presently they sit on 2nd best in the region. The Davis High girls’ basketball team has surpassed all expectations and will set a high standard for the rest of Davis High School. Go team! The Davis Darts have officially started region play. The Darts are .500 at 6-6 overall. They are looking to come back from a tough loss to Fremont High School. It was not a good game for the Darts but they will be going into this week ready to play and play hard. The Weber warriors are 6-3 overall this season and have not played a region game yet. The Darts will be their first test. Hudson Schenk is the Warrior’s best player, he is averaging seventeen points a game. He is a shifty guard and will be looking to score. Davis’s sharp shooter Jake Sampson is looking to have a break out game against the Warriors. The three point specialist is averaging sixteen points a game. He will tough for the warriors to stop. They will be looking to try and not let him get in rhythm beyond the ark. “We need to move the ball, good things happen when we move the ball”. Davis has had great success when they pass the ball at least five times in a possession and they need to keep the ball moving if they want to put up points on the board. Davis will be coming out fast and strong and will be ready to beat the Warriors. As winter really settles in, Davis high athletics either take a break or move indoors. Despite the weather the Davis track team continues to practice and compete throughout the winter. Throughout this winter the team will compete it as many as 5 meets between now and the end of February, including a very large scale meet on a wooden track at Idaho State University. The head coach, Markham Hyde, is hope to lead the team into another successful indoor season, and to pave the way for another state title in the outdoor.